John Korfman (above, left), a grandson of the last Riverside Cemetery on-site cemetery manager, and professional land surveyor Dennis Rialland are helping to map out the parameters of various sections and the grave sites of nearly 2,500 people known to have been buried there since the late 1700s. It is hoped that their work will make the Towanda cemetery more historian-friendly and a more attractive memorial park for local residents. Much has changed around Riverside Cemetery in Towanda since the official recording of burial records began in 1830. The 5.5-acre field north of the downtown area and overlooking the Susquehanna River was already the burial ground of dozens of Revolutionary War and War of 1812 veterans. Over nearly two centuries, as neighborhoods slowly crept up to its borders on three sides, river canals were replaced by railroads and old River Street was eventually expanded to become the Merrill Parkway. Meanwhile, the ancient flood plain on which the cemetery is situated has shifted and settled, completely swallowing some of the oldest grave stones. Access and egress roads, as well as walkways between family plots have blurred over time as trees and shrubs have come and gone, their massive stumps and roots further altering the topography. The RCA board is thrilled that a team of surveyors has stepped up to help preserve part of Bradford County’s history and make it relevant to today’s citizens. The grave markers serve as a virtual who’s-who among families who still call the Towanda area home. Other names may not ring a bell, but they are representative of the enormous amount of local history stored there. The outer parameters of the cemetery – the official boundaries – were surveyed last year. 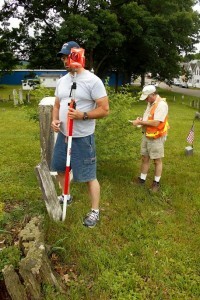 Now, the volunteers are in the process of surveying sections of the cemetery as they were developed and recorded. The cemetery was last surveyed in the mid 1800s, but no original copy of that map has been found. The survey team started with Section B because it is central to the site. It also contains a fairly equal number of older and newer plots. As the surveyors methodically work through the additional sections, modern technology will come into play. “There are many mapping hours ahead on the computer for a comprehensive contemporary map,” said Betsy McKeon, a retired professional land surveyor (PLS) who is helping with the project. The individual maps will be aligned and fit into the larger map that resulted from last year’s surveying. “Each located grave site will have a point number, a photograph, and any legible names and dates,” Fox Picou explained. This will help in the process of matching the cemetery’s current physical properties with burial records. “There is hope for reconciling records that show some persons buried in more than one location.” Also, she added, “It is not presently known how many people are buried in Section B.” The RCA hopes that the work will allow for mapping and signage to help visitors better find their way around. The possibility also exists of discovering available sites for new burials. Fox Picou suggested that the work could take a year or more, as the volunteers primarily work on weekends. PLS Dennis Rialland has referred to the project as “elephantine” in scope, as more than 2,400 people have been buried in the cemetery. Additional volunteers include PLS Jeffrey Geiss and John Korfman, a grandson of George Coleman, the last on-site manager of Riverside Cemetery. Their work will perfectly compliment another major project already underway, Fox Picou related. Digitalization of cemetery records also started last year, and it is hoped that, eventually, facts concerning the cemetery at many different levels can be simultaneously accessed after the digital records and findings of the surveying in process can be combined. “If money was available to pay the surveyors,” she offered as an example, “completion of the cemetery’s interior survey could move more quickly.” Sponsorship of one or more sections could lead to acknowledgements on forthcoming signage and on a planned website. General contributions are also welcome and can be mailed (in care of MF Picou) to Riverside Cemetery Association, 31 Walnut Street, Towanda, PA 18848. Direct deposits to the Riverside Cemetery Association at Citizens & Northern Bank can be made at any branch. Interested readers may also call Marguerite Fox Picou at 570-637-2281 for more information. 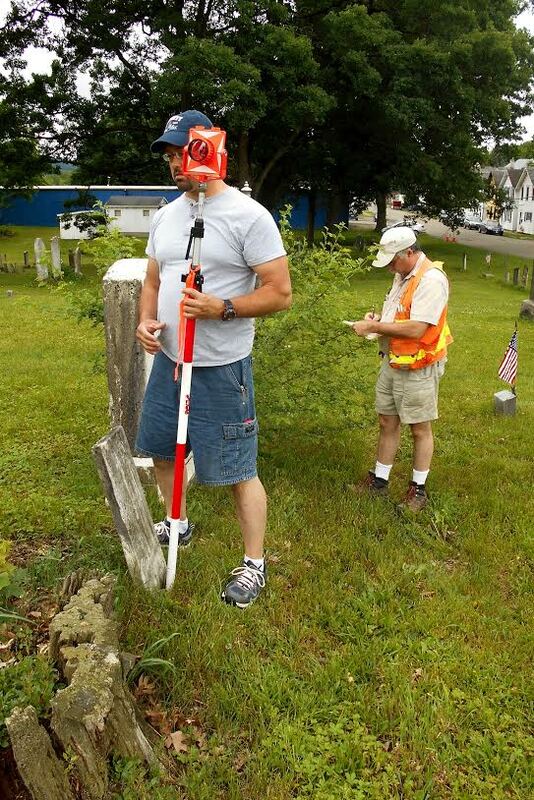 Professional land surveyor Jeff Geiss (above) communicates with an unseen teammate at Riverside Cemetery in Towanda. 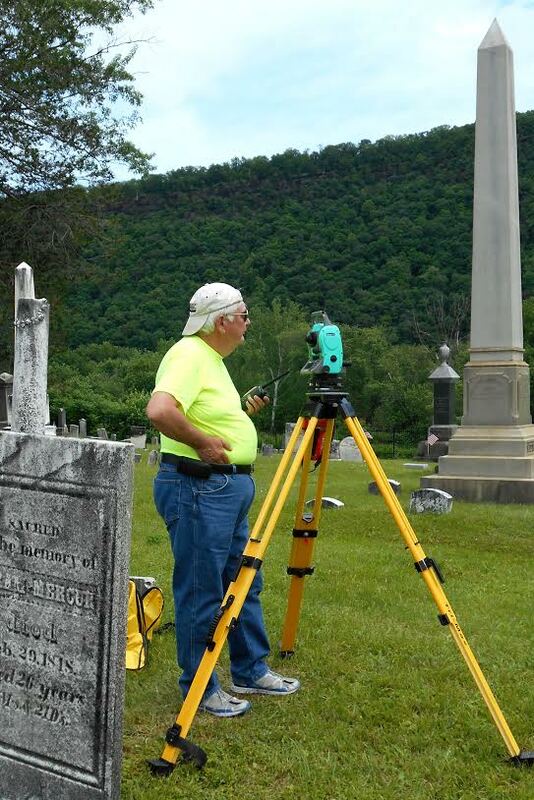 “Collecting the data from the Riverside Cemetery survey is one thing, but processing it into useful, coordinated accessible information is quite another,” says Riverside Cemetery Association (RCA) executive director Marguerite Fox Picou. Imperfect as they were, many hand-written records and notes were digitized this past winter. fought and died in the War of 1812. Numerous veterans of the Revolutionary War and War of 1812 are interred at Riverside Cemetery along with approximately 168 Civil War veterans.